Ask experienced Airstream owners, and they'll tell you: if you attend only one Airstream event this year, make it Alumapalooza, the official annual event held at the Airstream factory in Jackson Center, Ohio. Part Airstream rally, part seminar, part festival, Alumapalooza is designed for lovers of aluminum trailers, vintage trailers, or just RV travel—and the program is different each year. From May 27 to June 1, 250 Airstreamers will camp on the grounds at “The Mothership” for a week of workshops, demos, games, prizes, socials, entertainment, cookouts, and, of course, the fascinating tour of the Airstream factory. To celebrate the anniversary of the biggest, longest-running, and most famous Airstream gathering, here are the top five reasons to attend Alumapalooza! Whether your trailer is new or vintage, or you’re a experienced ‘streamer or an Airstreaming newbie, there’s something to for everyone to learn at the daily seminars, demonstrations, tech talks and Q&A sessions with the ultimate Airstream experts on the program. Topics will include hitching and towing, running gear, safety, winterizing and de-winterizing, general maintenance, awnings, polishing, and vintage restoration. A team of experts from the Airstream factory will share their expertise and intimate knowledge of Airstream coaches, and numerous vendors will be on site, too. Bring all your trailering questions! What do you like...music? Magic? Mayhem? Check, check and check. Singer-songwriter-guitarist (and Airstream full-timer) Josh Rogan will take the stage with his original songs and bluesy rock style. Master magician Eric Henning will wow the crowd with his elegant, old-fashioned slight-of-hand magic that has amazed adult audiences (including U.S. presidents) around the world. And the fun and fabulous team of Alexander Kensington and Charon Henning will present a “horrible and exciting” comedy thrill show that will have you laughing and cheering (and hiding your eyes). Airstreamers will be getting into the act, too. Those with talent will entertain at the open mic jam session; those with and without talent will perform at the hilarious Aluminum Gong Show. All of the money collected during this sidesplitting event will be given to a worthy local cause. There will be foodie fun every day at Alumapalooza! Come hungry: there will be open grills, a Dutch oven cooking workshop, a catered dinner—and even fun meals in the community during the Jackson Center Days celebration. Alumapaloozers will learn to prepare an elegant four-course meal in a real Airstream galley during the Aluminum Chef session, and take a behind-the-scenes tour of the nearby KitchenAid factory that includes a cooking demonstration and tasting in the visitor kitchen. Also on the program is a trip to Bear’s Mill, where a special group will learn how artisan grain is ground by 160-year old millstones, collect recipes and free product samples, and enjoy gourmet coffee and baked treats. And speaking of the offsite tours: they’re new this year to the Alumapalooza program! Special group tours have been organized to visit some hidden gems and fascinating attractions within a short distance from the Airstream factory. The Armstrong Air and Space Museum holds a collection of rare treasures: Neil Armstrong’s Gemini and Apollo spacesuits, a Gemini VIII capsule, a moon rock, and many more exciting artifacts from NASA programs. A group tour just for Alumapalooza attendees will also include a special presentation on the Mobile Quarantine Facilities—the Airstream trailers NASA used to receive and house Apollo astronauts returning to Earth from their moon missions. The state of Ohio holds an important role in the history of the bicycle, and a group will see the vast collection of amazing bikes (and trikes and unicycles) that make their home at the Bicycle Museum of America, filled to the rafters with more than 350 bicycles of all shapes, sizes, makes and models—as well as some made famous in Hollywood. A tour is even scheduled to visit “The Temple of Tolerance”, a quirky art installation and rock garden hidden in plain sight in a residential backyard. It’s a local wonder! Back at the main tent outside the factory, Airstreamers will benefit from lifestyle seminars on a variety of topics: working from the road, Airstream interior design, travel destinations, and a book reading and signing by a nationally-recognized author. 5. Experiences...that you’ll only have at Alumapalooza. Airstreamers make up an eclectic and diverse group—of all ages and backgrounds—who might never have met without their common love of aluminum. Alumapalooza brings together far-flung friends in the Airstream community, and provides countless opportunities to make new friends, too. Socializing is unlimited, and the camaraderie is contagious during the infamous Backup Derby and the “Rivet Masters” competition inside the factory. Other fun activities include The Airstream Oscars, visits to The Love Story Project Airstream, daily yoga, bike riding, happy hours (and “yappy” hour for dog owners), kite flying, swap meet, 5K fun run, and a pool party. Perhaps the most memorable moments of the week are made at the Airstream factory tour. Led by a long-time employee of Airstream, the 3/4-mile tour through the factory is fascinating, and the process involved to build each and every aluminum Airstream trailer may surprise you. Watch and learn as coaches in various stages of assembly pass through specialized workstations where plumbing, furniture and lighting is installed, rivets are bucked into the aluminum paneling, units are checked for leaks, and finally furnished, decorated, and affixed with insignia. Whew! When else can you see where your Airstream was made, meet Airstream leadership and the men and women who build them by hand, and hang out with hundreds of your fellow Airstreamers, all camped on the grounds of the factory? 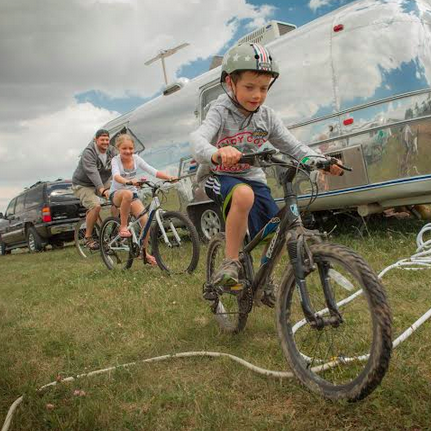 Alumapalooza is a blast... and a not-to-be-missed experience for any Airstream owner. There’s still time to join the fun at Alumapalooza 5, but hurry! Registration closes today! Sign up here!